Last week, we were able to check another box of our extended bucket list. Although we aren’t doing everything that I want, I am keeping my kids occupied, utilizing the library and a friend’s pool most of all. I have not up any undo pressure on myself to make sure that I make it through the list, but I have a list of potential options when I get “stuck”. Back to last week. I decided to go see Hook with our friends. Getting the children up and out the door before 9:30 in the morning is definitely proving to be a challenge, but when we do, it’s so worth it. Our friends had already arrived at the theater by 9:30 and texted me indicating that seats had been saved and she was in Theater 11. With all the commotion with children coming in, I was comforted knowing that I didn’t have to struggle to find a seat. I got us all checked in (and even though we were assigned theater 14), I marched confidently to Theater 11, only to find out that my friend’s mother had failed to save enough seats for us all. I quickly rushed down to Theater 14, hoping to find decent seats for the four of us. Thankfully I did, off to the side, but where we were in a partial row. The huge benefit of this was that our constant moving wasn’t a distraction to our neighbors and we weren’t sitting directly in front of anyone to disturb them. I think I saw Hook once many years ago. This time had a very different feel, one of relating to Peter Pan instead of my previous viewing where I related to the son. Even though this was an oldie, it was certainly a goody. For the price (FREE), it was certainly worth doing again. (CityPlace, West Palm Beach) Carmike Theater on Wednesdays and Thursdays at 10 a.m. ($4 includes popcorn and drink). (Boynton Beach/Boca Raton) Cinemark’s Summer Movie Clubhouse on Mondays, Tuesdays & Wednesdays at 10 a.m. ($1 each or $5 for the entire summer). 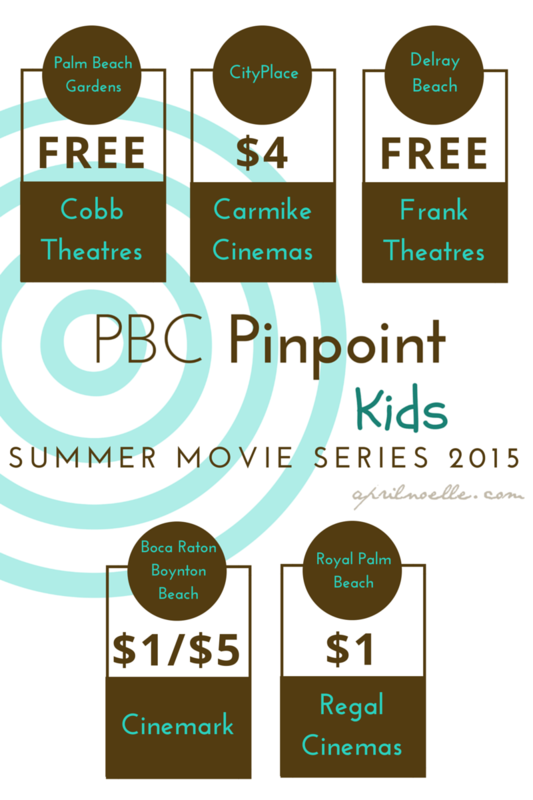 Do you know of any movie theaters in Palm Beach County that has free or discounted movies for kids? Hi April, this is Minnie with Turn it up Tuesday, your kids are adorable, that’s great that you’re getting in that family time with your children because those are memories that will out last every other memory, have a week. How fun! I wish I was closer, or had something like this close to us. I think it’s a fun idea, and my kids would love it! This is such a great idea. I wish they did something like this in my area when my son was younger. I am in Palm Beach County near the zoo! I am going on these sites now and checking them out! Thank you for the resource! This would be a great way to spend the night with the kids. I love finding cost effective ways to spend time together. We love the free/cheap summer movies. They are usually older movies but it is still a great way to get out of the heat and spend time together. What a fun way to spend time with the family. Our library usually does something similar, but we have yet to check it out. All these sound fun and I love that they’re free. I wish we live closer. It is nice when you can find cheap entertainment for the kiddos. And the movies are always a fave! This is some great information. I have found that it has gotten quite expensive to take the entire family to the movies for a family outing. I wish we had cheap movies here! Never cheaper than $6 a movie per person! I love all the movies deals that you can get during the summer. I even enjoy going to the movies for kids myself. I want cheap movies! Everything is pricey in California, ughhh! We are not in that area, but our local theatre does something similar. There are some that do. I know where I used to live, in California, two theaters had it year round. Not several days a week, like these, but once or twice a month. It was great.